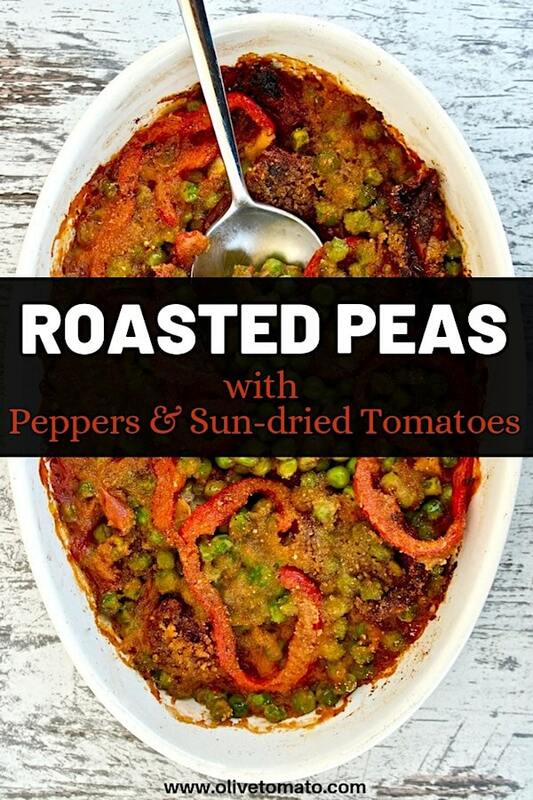 These luscious roasted peas with tomato sauce and sweet red bell pepper along with sun-dried tomatoes will make a delicious and satisfying, Mediterranean main course. Peas tend to be a boring side dish in Western cuisine, my mind goes to those old-school TV dinners. In the Mediterranean we stew peas in tomato sauce and herbs and they are the main actor of the meal, rather than a necessary side dish. 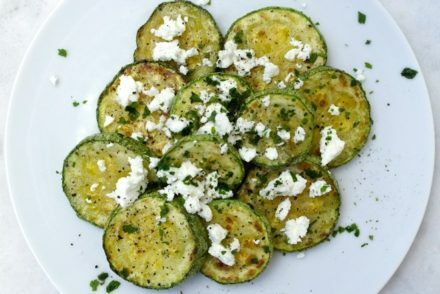 They are considered a staple in the Greek kitchen. We have them once a week as a main course along with feta and bread. And while the kids eat them, they are getting a bit bored, which is why I’m so happy I came across another delicious way to prepare them: roasted! I was inspired by a recipe on a calendar from the Greek frozen foods company Barba Stathis, and I’m so glad I did. 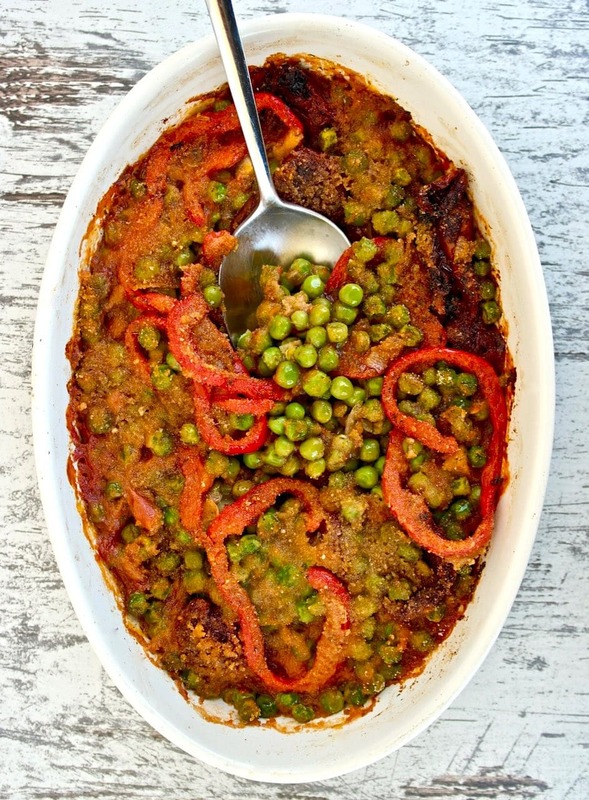 This easy recipe takes peas to a new level! The peas are roasted until they are rich and thick, infused with all the flavor from the peppers and sun-dried tomatoes. A delicious dish that I will be making regularly. Many people consider peas just a starchy vegetable with little nutritional value, but actually it is quite the opposite. Peas belong to the legume family, they have very few calories and are rich in nutrients. A cup of cooked peas has about 130 calories, 8 grams of protein and 9 grams of fiber (the type that lowers your cholesterol), that in itself is impressive. But that’s not all, peas are also a great source of folate, vitamin A, C, K, and also iron, copper and manganese. In addition, peas are one of the top vegetable sources of phytosterols, a group of natural compounds found in plants which may block the absorption of cholesterol. Finally, peas are a good source of antioxidants, specifically lutein, and zeaxanthin, which play an important role in maintaining the health of skin and eyes. 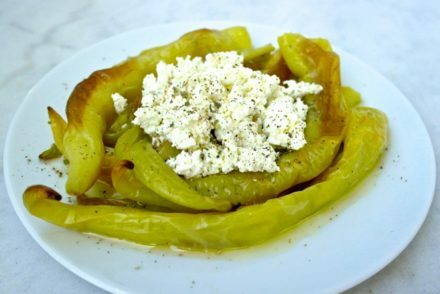 In this specific dish you will be getting additional nutrients and antioxidants from the extra virgin olive oil, tomato, and peppers. Plus the olive oil helps absorb even more nutrients. Frozen vegetables in general maintain their nutrients (in some cases even more than fresh), I always keep bags of peas, green beans and spinach in my freezer. But if you can get your hands on fresh peas in their pod, they are delicious. So let’s get on with the recipe. Within a Mediterranean Diet you would eat this as a main course, as is or with a bit of feta (cheese) and some bread if you wish. A serving size is a big bowl, about 1 ½ cup. This can be consumed warm or at room temperature and can be stored in the refrigerator for 3 days. 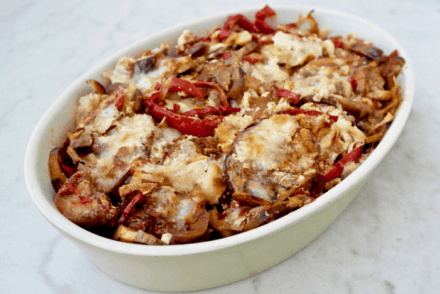 Roasted peas with tomato sauce and sweet red bell pepper along with sun-dried tomatoes will make delicious and satisfying, Mediterranean main course. In a pan, heat 2 tablespoons of the olive oil and sauté the onion and bell pepper for about 5 minutes. Remove from heat and set aside. In a large pot with boiling water add the 2 bay leaves and the peas. Boil for 2 minutes. Remove and drain. In a bowl mix gently the peas, onion and pepper, bay leaves, tomato, dill, salt and the sun-dried tomatoes. Empty the mixture in a casserole dish (about 2 L). Drizzle over the rest of the olive oil. Sprinkle with the breadcrumbs. Add about ½ cup hot water in the side of the dish titling so that the water spreads at the whole base of the dish. Grind some black pepper over it and bake in the oven for about 30 minutes until the peas have thickened. Serve as is or with feta. Add more hot water as needed, if peas begin to dry. 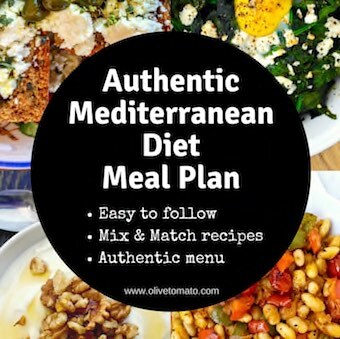 Get the latest Olive Tomato articles and recipes in your inbox! Do you use sun dried tomatoes in oil, or dry? Any suggestions as an alternate to dill? I’m eager to make this! I couldn’t wait to make it so I used my own judgement! I used sun dried tomatoes in oil, diced; I also diced the red pepper; and without dry or fresh dill I used 1/2 tsp Greek oregano. It was delicious!!! My Greek friend was in the area, so as it was already baking in the oven, i invited her over for an impromptu lunch, and we both loved it! I had to cook it quite a bit longer, and definitely think it serves 6 generous main dish servings, depending on your appetite of course! Thanks for another great recipe!